Can’t remember what folder you stuffed that iOS app into? If you have a ton of apps on your iPhone or iPad, try rearranging them all by their actions (or by verbs), rather than by the apps category. Although you’ll have to do this manually by moving apps around and renaming or creating folders yourself, it’s actually more intuitive and it’s easier to find things based on what they help you to do rather than some rough categorization that isn’t always the most descriptive. You could go beyond iOS and do this with OS X Lion’s LaunchPad as well, but the larger Mac screens and optional nature of Launchpad seem to make folders much less necessary there. You can’t hide from it. I don’t understand the app clutter problem, but then again I also don’t install all the garbage most people litter their iPhones with. How many apps do you really need to send an email, take a picture, or write a note? I’ve found that as soon as I put something into a Folder I stop using it. I only have one now and it’s a virtual “Lost and Found” archive on the second page of my iPad screen that gets use once a month or so at most. This is exactly what I do! I love only having one or two pages on my iPhone/iPad. talking of uses, anyone know of an app that allows me to modify images? i kinda play a lot of RPG and it’s very useful to have the map of the land and mark the sites i’ve already looted. like fingerpainting over the map of Oblivion. Why Newsstand is not delete-able Apple, WHY?? Interesting approach. Where may I find the wallpaper as used above? 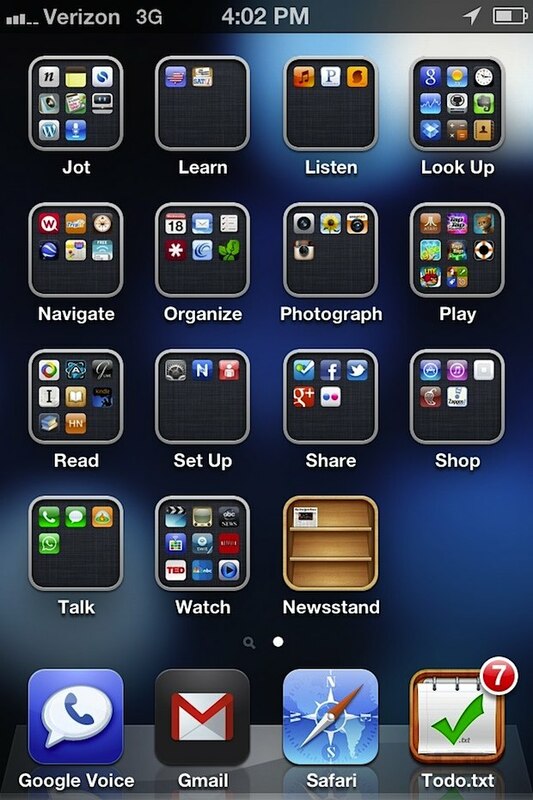 You only have this problem on a cluttered sluggist OS like the one iPhone has. It’s so simple its disgusting.